EDI s wide range of vehicle detection products help technicians save valuable time and maximize profits by quickly installing, accurately trouble-shooting, and reliably maintaining access control systems with easy to use hi-tech vehicle detectors that provide built-in set-up tools, frequency & sensitivity meters, and non-volatile diagnostic history, all of which are invaluable and always available Because they re built-in! The LMA-1800-LP operates with extremely low power requirements making it suitable for solar and battery powered applications. Note that this product is only intended for applications requiring low operating current such as battery or solar powered designs. Performance characteristics are different than the standard LMA-1250 product. Power consumption in the No Detect state is less than 8 milliamps. With a vehicle over the roadway loop, the DEFLECTOMETERTM functions as a Sensitivity Meter. Automatic quantitative feedback of the loop system operation ensures the most optimum sensitivity level to detect ALL vehicles, including motorcycles and high-bed vehicles. 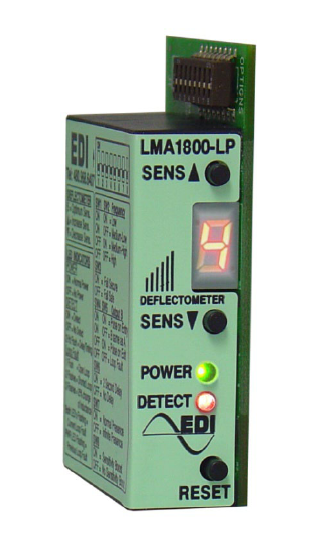 LMA-1800 operates on 12VDC, 24VDC, and 24VAC.